Typically, when building owners, designers, and architects plan for ADA requirements, they think about guests in wheelchairs. Universal design asks you to think beyond that and consider creating a space that is functional for the greatest variety of users no matter their physical circumstances or stage of life. Universal design is about creating an atmosphere of inclusivity. A restroom that does not adhere to Universal Design principals can leave many who use it feeling as though their needs are not important to the building owner. Who are the people you want to make sure you are accommodating? People who use mobility equipment - Don’t just think of wheelchair accessibility. Think about how people maneuver when using a walker, crutches, cane, or even scooter. Are your doorways wide enough to fit through? Is there a place someone can rest a cane or crutches so they don’t fall onto the floor? People who have temporary health problems - How easy is it for someone who has a cast on their arm or leg to do their business? Grab bars would go a long way to ensure people still getting used to their situation can keep their balance. Children and short or tall people - Put yourself in the shoes of someone who is four feet tall, as well as someone who is six and a half feet tall. Can they see their face in the mirror? Can they reach the sink comfortably? Can they access the hand dryers or paper towels? 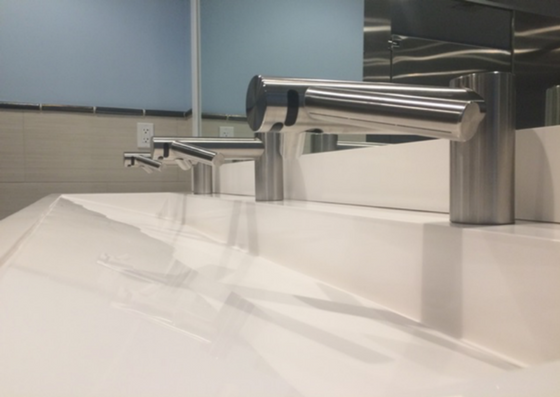 Adult and child ADA compliant sinks. Dyson Tap Faucet + the pitched sink to avoid the mess children make with paper towels. People with stability and balance issues - Similar to people trying to adjust to maneuvering with limited mobility due to a broken bone, people who have balance issues can benefit greatly by having access to grab bars throughout the restroom, not just in the stalls. People who are large or heavy - Can your toilets adequately and safely hold the weight of a large or heavy individual? Porcelain fixtures are not only more delicate but should they break under a heavy load they can cause serious injury to the user. Consider stainless steel toilets and if you use wall mounted fixtures, be sure to match them with the proper carrier. People who may have reduced strength, arthritis, or flexibility issues - If you’ve never had arthritis you likely don’t know how difficult something like opening a heavy door or turning on a faucet can be. Ideally, you should be able to manage both these obstacles with the push of a finger. People who require assistance - We’re all familiar with family bathrooms where parents can assist their children, but have you considered that some people who have some of the issues we’ve already mentioned need assistance from their caregivers? It’s good practice to provide access to bathroom accommodations that are roomy enough for two people to maneuver. People with visual impairments - Walking into an unfamiliar room presents challenges to those who are visually impaired. The danger for them is protruding objects such as hand dryers and paper towel dispensers. Follow ADA guidelines for placement and consider adding signage in braille. Purchase products with several options for mounting, configuration, and space saving attributes. When you choose products based on what works best for the application instead of trying a one-size-fits-all approach, everyone can easily use the space. 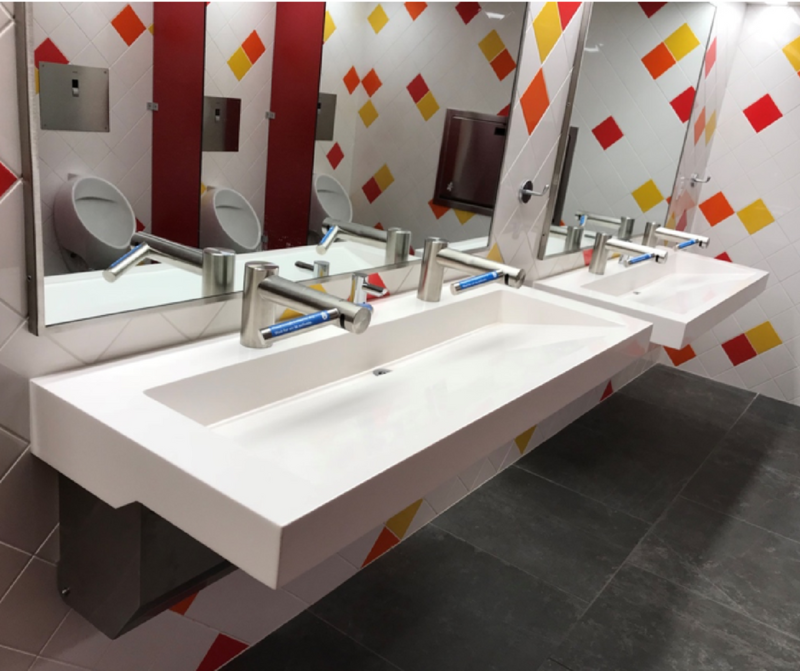 For more ways to make your restroom more appealing to the public and your employees, please read our tips on Hygienic Bathroom Design, Vandal Resistant Bathrooms, and Sustainable Restroom Design.